Carolyn Custis James has written a seminal work on masculine identity using the biblical story. She invites the reader to consider the impact of the fall on men and God’s redemptive work to restore a man’s identity. Similar to her writing in Lost Women of the Bible, James’s exegesis helps the reader read between the lines of the stories of men in scripture. She steers clear of “male as leader” interpretations and avoids the western cultural lens that only notices the strong man or hero. Instead, James helps us visualize each story within the cultural context of patriarchy, all the while helping us “see through” patriarchy to what God was doing redemptively in the midst of a system distorted by the fall. James begins by illustrating how the fall disrupts the lives of men. 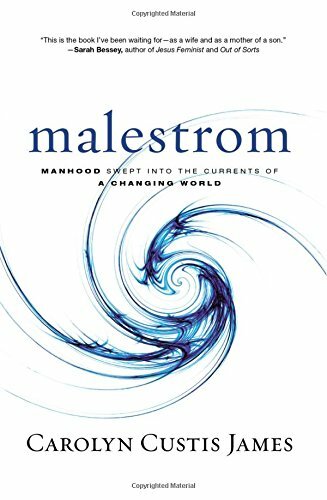 She coins the term “malestrom” to describe the global and far-reaching effects of the fall on humankind and on men in particular. Her play on words demonstrates that, just as a maelstrom is a powerful whirlpool with the potential to destroy those caught in its pull, the “malestrom” is “the particular way in which the fall impacts the male of the human species—causing a man to lose himself, his identity and purpose as a man, and above all, to lose sight of God’s original vision for his sons” (18). The “malestrom” not only has a powerful influence on men, it also impacts women and disrupts the Blessed Alliance1 God intends as men and women partner in the redemptive mission of God. James argues that the principle expression of the “malestrom” is historic patriarchy (30). She defines patriarchy as a social system in which the role of the male is the primary authority figure in organizations, families, and legal and political structures (31). She also notes its influence on religious systems, whether it is the “soft patriarchy” of evangelical churches or the more extreme and violent structures of the Taliban and Isis. One of James’s strengths is that she does not solely address the typical male-female issues in the Christian subculture. She also tackles patriarchy as a global phenomenon and frequently makes reference to how it impacts global systems and family structures. The majority of the book tackles biblical stories of men, viewing each through the lens of patriarchy, and providing interpretations that are often overlooked. She skillfully shows how each story illustrates part of the “missing chapter” and gives us a glimpse of life as God intends. Particularly poignant is the story of Barak and Deborah. Interpreters often describe Barak as a weak male; God therefore allowed Deborah to lead since Barak would not. James turns the tables on this interpretation— not only was Deborah God’s choice for leadership, but Barak is a living example of the “missing chapter” by being one who was not threatened by Deborah’s leadership. He rejoiced with her in the defeat of the enemy. By doing so, Barak and Deborah, along with Jael, illustrate the Blessed Alliance through their “mutually dependent efforts” (110). While the format of this book is similar to that of Lost Women of the Bible, in Malestrom James makes a significant shift. She no longer writes using complementarian overtones. Instead, she affirms the Blessed Alliance as an interwoven, interdependent, and inseparable partnership (26) and presents compelling stories supporting the equality of men and women throughout her book. Even so, James seems to be averse to using the term “equal” to define the Blessed Alliance. She alludes to equality only when describing it as a faulty starting point for a discussion on what it means to be male (40). James also pushes back against evangelical egalitarianism saying, “even that system does not go far enough” (69). She aligns herself with David Fitch’s broad-sweeping perspective that egalitarian approaches to leadership (often unintentionally) utilize male systems of leadership and invite women into them. James says Jesus is “making something new” by recovering the missing chapter, not creating another world system (69). James seems to support a middle or alternative stance. Unfortunately, her illustrations put her at odds with egalitarianism rather than finding important common ground (69, 99). Even though she differentiates herself from egalitarianism, she never expands upon nor clarifies her own position within the text. Malestrom, while compelling, could be strengthened by the following. First, questions remain as to why she distances herself from egalitarianism. She would bring clarity to her work by not only expanding upon her differences but also recognizing common ground. Second, I was surprised that James uses the pronoun “he” when referring to God. It seems a glaring oversight. She could have strengthened her writing and her argument by using more inclusive language. Another bit of feedback comes via a male friend. While he enjoyed the book immensely, he was puzzled about the chapter on Abraham (ch. 2). His question was, “I understand James’s argument about the impact of patriarchy on humankind. But, with Abraham, wasn’t God’s call one that would be a patriarch’s dream . . . to be the Father of a great nation? How do I know that James’s interpretation is not a bit of confirmation bias?” As we discussed his question further, it became apparent that more historical and cultural research into the patriarchal context of Abraham and each biblical story would have strengthened her writing and premise. By using broad strokes to define patriarchy, she neglects providing scholarly historical and cultural support for her interpretations of each story. 1. “Blessed Alliance” is a phrase coined by James in her previous work and used in this book as well. It describes the partnered alliance between men and women in the redemptive work of God. By calling it a “blessed alliance,” she notes that men and women need one another to accomplish God’s purposes. 2. James coins the term “ezer warriors” to describe the role of women as “strong helpers,” referring to the phrase ezer kenegdo in Gen 2:18, 20 and the frequent OT description of God as ezer (“helper”). 3. Readers are invited also to read Mark Kubo’s review of Malestrom in the autumn 2015 issue of Mutuality.